US President Donald Trump’s decision to phone Turkish President Tayyip Erdogan on April 14 and be the only Western leader to congratulate him on winning inflated powers in a popular referendum had many seasoned observers guessing. The White House confirmed the call had taken place. But congratulating the newly-empowered Turkish president was not Trump’s first priority; Syria was. The White House in fact sidestepped questions about the poll’s results, saying a full report was awaited from the international election monitors officiating at the referendum. DEBKA Weekly’s Washington sources note that Donald Trump’s call to the Turkish president, at a peak moment in the North Korea crisis, provided a rare close-up of how the US president’s decision-making process works and how he manages his foreign relations and security affairs. He put in the call to the presidential palace in Ankara without consulting Secretary of State Rex Tillerson or Defense Secretary James Mattis. He did not ask for advice or even inform them about what he intended to propose to Erdogan. Only a couple of National Security Council officials suspected what he was up to when he asked them for an update on the situation in Syria. Without further ado, Trump put before the Turkish president a proposal that would be hard to resist. Our sources reveal that he first drew a picture on the following lines: We (in Washington) know exactly how the Syrian Kurdish political wing, the PYD and its YPG militia operate. Their Afrin enclave in the west has been made available for a Russian base; the central Kobani enclave cooperates fully with the American army; so too does the northern pocket of Qamishli, although it also maintains intelligence and economic ties with the Assad regime in Damascus. Nonetheless, he explained, the United States continues to train YPG militiamen, providing them with weapons, ammunition and funds, because they are the only ground force currently available that is capable of breaking through to the Raqqa stronghold and wresting it from the Islamic State. Trump said he is fully aware that Turkey is flatly opposed to this plan. He then recalled that Turkish Defense Minister Firki Isik had paid a quick visit to Washington on April 14 to present a new plan for an operation to liberate Raqqa without engaging the Syrian Kurdish YPG forces. This plan had already been shown to Secretaries Tillerson and Mattis. The President then dropped his bombshell. If Turkey could move fast and put together an army of 30,000 ground troops capable of conquering Raqqa, the Trump administration would not wait for the Kurds to get their act together for the operation. Trump made it clear that there was no time for discussion and detailed planning. 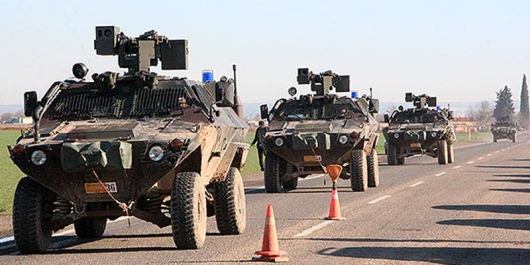 Erdogan was required to make a fast decision and get his troops onto the battlefield with all possible speed. To spur him on, the US President assured the Turkish leader that if he accepted the challenge, he would instruct the Pentagon and the US army to provide the Turkish troops with anything they needed in the way of US air cover, artillery support or even cruise missile assaults on ISIS targets. Although the Turkish president replied that he would think it over for a few days, it is hard to see him resisting the huge temptations offered by the Trump proposal. It would open the door for tens of thousands of Turkish troops to move into northern Syria. The operation on offer would enable him to divide the two Kurdish enclaves of Qamishli and Kobani and so put paid to the Kurdish dream of establishing a semiautonomous Kurdish state abutting the Turkish border. Furthermore, the conquest of Raqqa with US support would place a high Turkish wall in the way of Iran’s projected land bridge through Iraq to Syria and the Mediterranean.